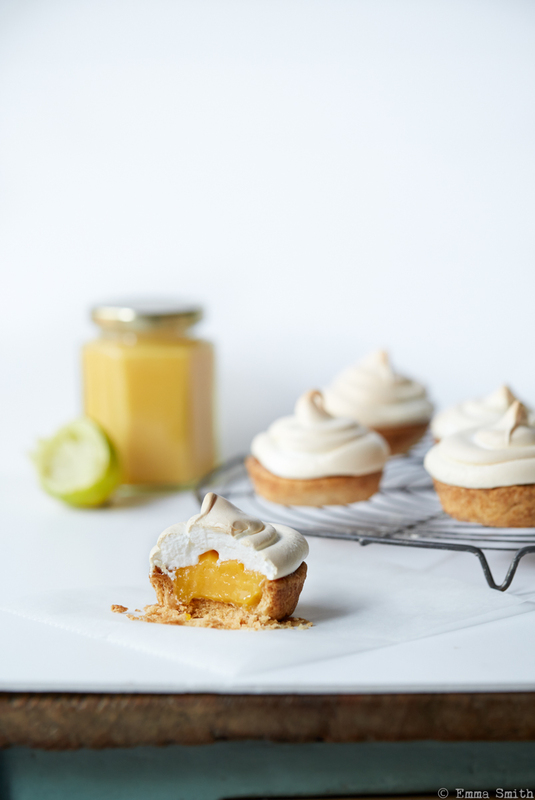 This post was born out of the need to use up a lot of eggs before I go away so you may curse my frivolous use of whole eggs in the lime curd and the subsequent redundant yolks from the meringue. You could of course use another curd recipe that used yolks only but these generally require the use of cornflour and I much prefer a cornflour free curd. This recipe also leaves a lot of surplus lime curd which can be decanted to a jar and stored in the fridge for other uses or another batch of pies. Start by adding the flour, salt, sugar and butter to a food processor, whizzing until you get fine breadcrumbs and there are no lumps of butter remaining. With the processor still running, gradually add the water a tablespoon at a time until a dough comes together and forms a ball. Wrap the dough tightly in cling film and chill in the fridge for at least 15 minutes. Preheat the oven to 180c or gas mark 4 and lightly grease a 12 hole muffin pan with butter. While the dough is resting, start the curd by melting the butter in a heavy based saucepan. Add all the other ingredients to the pan and whisk to a custard over a low heat and then set aside to cool. Roll out the pastry on a lightly floured work surface to approximately 3mm thick and cut into rounds using a 9cm/3.5″ diameter round, straight-edged cutter. Gently press into the muffin pan and pierce the bottoms with a fork before blind baking on the middle shelf of the oven for 15 minutes or until the pastry is cooked and golden in colour. Remove from the oven and allow to cool. Reduce the oven temperature to 170c or gas mark 3. Now for the meringue, add the egg whites and icing sugar to the bowl of a stand mixer and whisk using the balloon whisk attachment for at least 10 minutes until the meringue is thick and glossy and stands in stiff peaks. Remove the pastry cases to a baking tray and spoon some lime curd into each one levelling off to the height of the pastry case. Spoon the meringue into a piping bag fitted with a 1cm diameter round nozzle and pipe a swirl of meringue starting from the outside and working up. Return to the oven to brown the meringue for 8-10 minutes. Leave to cool before serving. Theses are so sweet! I love individual desserts! Thanks so much. I think they look cute so gonna start doing more individual cakes and desserts soon! Love this bit .... are we nearly there yet? How to maintain fitness success -- deliciously. Cooking is no mean feast! Putting food in your eyes.